It's best to leave the myths be and indulge in the scenic grandeur of this quaint hill town. A tiny hamlet located in Parvati Valley of Himachal Pradesh, Malana is supremely rich in biodiversity. Popularly known for malana cream, a kind of drug originated here, this quaint village is full of untold stories and age-old secrets. A lot of travellers come to the town in the quest of uncovering the myths, that sets Malana apart from other villages in the state. Apparently, it’s the most ancient democracy of the world, that had its own village council for the longest time. Interestingly, the locals here consider themselves to be the descendants of the Aryans. 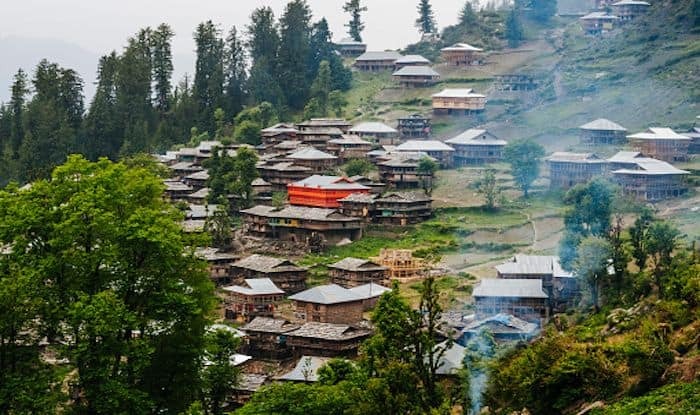 Malana is an exceptionally picturesque village; though there isn’t a lot to do in terms of sightseeing, the gorgeous panoramas of the verdant landscapes are enough to fill your heart with joy. However, you must abide by the few rules of this village: the locals expect travellers to not touch the walls or step into the courtyard of any of the village houses. One of the major attractions here is the Jamdagni Temple, a significant religious site for the Malanese. Built of wood and stone, the shrine inside the temple lends a rustic vibe to the structure. It is located right at the core of the village, and they levy fine on those who’re not careful, and touch the walls of the temple while entering it. Similarly, the Shrine of Renuka Devi attracts hordes of travellers for its elaborate woodwork and remarkable architecture. Situated in lower Malana, you will find horns of sacrificed animals on the temple’s façade along with bangles of the locals which symbolise of femininity. Apart from these, there are some gorgeous trekking trails in Malana. The dense forests and the rolling mountains are not exactly easy to traverse, so it’s recommended that you undertake treks in a group, preferably with an experienced guide for company.